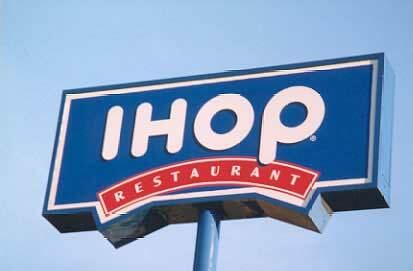 Any day that begins with IHOP is a good day, I always say... um, starting now. And after grabbing some delicious grub with my older brother Ryan and his wife Kate, Denise and I hit the road with my parents from Tucson to San Diego. Because of our leisurely pace (and almost running out of gas in the mountains... in the middle of nowhere... in the dark) we didn't get to our hotel until about 8:30pm local time. We already got a great rate at the Pacific Terrace Hotel, but due to availability we were upgraded to junior suites with ocean views (although we can't really see much of it in the moonlight). The room is really plush. And considering the last hotel room I stayed in a couple months ago was in Manhattan, it's downright gigantic in comparison... and at a fraction of the cost. In addition to the ocean view, large wood beds, marble bathrooms, and a flat-panel TV that I estimate at about 42", we get free wine! And as if all that wasn't enough, they actually managed to dig up a charger for my near-dead cell phone since, like an idiot, I left my charger in Tucson. I have no idea what the plan is for tomorrow but after spending all of Friday afternoon traveling to Tucson and most of today trekking to San Diego, sleeping in and taking it easy are definitely top priorities!